The Rocinante sheds its gas-hauler disguise in the final episode of "The Expanse" Season 1. The crew will have to grapple with a solar system in turmoil in Season 2. 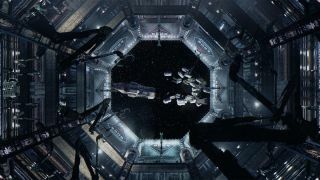 NEW YORK — Syfy's flagship space adventure series, "The Expanse," teased a second season full of intrigue and cross-solar-system conflict at New York Comic Con on Oct. 8 — plus, as always, plenty of spacefaring action and stellar special effects. The new season will begin on the Syfy Channel in early 2017. At the New York Comic Con panel in the city's Hammerstein Ballroom, fans watched a still-unreleased trailer and exclusive clip from the production's second season that showed off the series' action ambitions, with two ships fighting among the rings of a large space station, and then asked questions of the featured cast and creative team. As repeated in the trailer's background music, individual crew members this season will be forced to pick a side: as tensions grow among inhabitants of Earth, Mars and the Asteroid Belt, they will increasingly be asked, "Which side are you on?" Nagata, the ship's engineer, seems to have deep ties to the rebel faction among the Asteroid Beltfighting for more rights, for instance, and can come into the conflict with Holden, the captain, who hails from Earth. All of them, and the rest of the solar system inhabitants, grapple with the changes in power dynamics and threat brought by the superweapon revealed during the show's first season — which could make or break any of the factions. "The overarching themes, the political and playing out of the struggles between the Belt, Earth and Mars, actually get boiled down into the personal struggles, especially in the Roci crew between me and Holden, as an Earther and a Belter — you all get to see everyone's individual struggles within this big system much more deeply this season," Tipper said during the panel. "We built the world, we gave everyone the world, that's clear now — and now … you see a bit more of what makes them tick, what drives them, and what comes in between them." "Bobbi is brilliantly played by Frankie Adams, and a huge new part of the season," Fergus said. "We felt like if 'pick a side' is sort of the theme that's running through the season, we have the Martian perspective that has been only touched on in Season 1 [through the eyes of] someone on the ground who really embodies the aspirations of her whole planet." We will also see Holden continue to struggle with his role as leader, his responsibility for the systemwide crisis, and the hard decisions — "the mission comes first" — that seem to come easily to his unlikely partner from Season 1, Detective Miller (played by Thomas Jane). In a way, Strait said, Miller finds his humanity and idealism as Holden's is stripped away somewhat over the course of their storylines. Fans of the book series — including at Space.com — are wondering exactly how the plot of the books will fit into the TV show, which covered about two-thirds of the first book over the course of the previous season. In regards to a climactic scene at the end of the first book involving Miller, Fergus was rather evasive: "We're interested in maintaining the integrity and the soul of the books, and at the same time this thing has taken on a life of its own … it evolves and becomes something that is very respectful of the books, but the story's going where the story needs to go." The Rocinante crew will go through a lot this season, it's clear — to book and TV fans alike — and the cast emphasized that as they navigate the broader, quickly complicating world the plot will come back to their relationships as they forge a path through the solar system. "We're piloting, we're driving one of the most sophisticated pieces of military machinery, the Rocinante — it's probably the elite-elite of the gunships in the Martian fleet — and none of us are military," Anvar said. "Holden and Alex are ex-military, but we are a completely civilian, completely personal group. So there is no code that governs us to obey; there is no hierarchy, there is no anything. All that governs us is if we believe in each other. So when Holden goes off the rails, when anything happens that we don't believe in, the friction, the conflict, the whole system can just fall apart." "We all have to get along in order to survive, we have to believe in each other," he added. "That's what fuels a lot of Season 2."